Loves to visit, preach, teach and share in faith conversations. Serves on the Mission Table of the Oregon Synod. Explores photography as a spiritual practice. Enjoys hiking in the Columbia River Gorge. 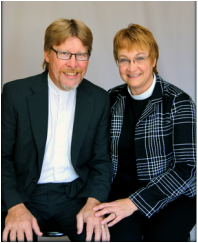 Has served the church for over 35 years and West Linn Lutheran Church for over 9. Grew up as a pastor's kid in Illinois and Nebraska. Has been married over 35 years and has 4 children. Studied Biology and Theology at Roanoke College. Grew up in Lake Oswego area. Serves as a substitute teacher. Enjoys watching and participating in musicals theater. Mother of two great kids. Jack works with pastors, other staff and lay leadership to create realistic and internal and external communication strategies to support the congregation’s activities. Originally from South Carolina, Jack has worked in higher educations settings all across the United States and Europe. Jack recently got married to his husband Chris, and moved to SE Portland. Is married to his wife and has three boys. Teaches music in a middle school setting. Can play all of Billy Joel's music. Worked 30 plus years in accounting. Lived in 7 states, traveled to all 50 states. Happily married 23 years with one daughter. Love to travel, explore hike. An educator for 37 years of teaching. Great cook, love to travel and great at jumping rope.